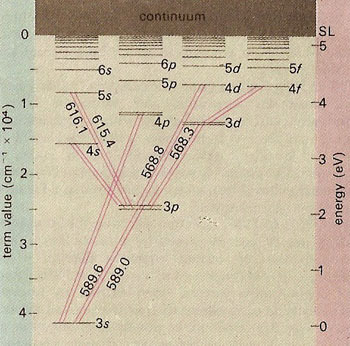 Energy-level diagram for sodium. The ground state for the sodium's valence electron is designated 3s. Some of the allowed transitions to other energy levels are shown as red lines; the transitions which principally feature in the sodium emission spectrum are labeled in nanometers. The transition 3p to 3s is responsible for the yellow sodium D lines of the solar spectrum and the bright yellow color of the sodium flame and of sodium vapor lamps. Electrons raised above the series limit (SL) value are lost from the atom, which is thus ionized. An energy level is a stationary state of a physical system characterized by its having or being able to have a fixed quantity of energy. Quantum mechanics assumes that physical systems can only exist in a well-defined set of energy levels The emission of electromagnetic radiation is associated with transitions of electronic and molecular systems between energy levels.